Xenses is a park with more than 15 activities that will take you on a fantastic journey through air, land and water to revive your senses and awaken those you didn't know you had. Creating sensorial, olfactory, auditory and tactile experiences that will involve the mind and senses of visitors using various natural elements such as water, vegetation and land and with the help of visual effects, which will cause disputes over our own thoughts and judgments. Xenses New Park is a half-day tour, experience this exciting park with 5 hours of a lot of fun! A great adventure which allows you to do another activities after visit. Xenses will play with our senses, sensory stimulations tours, thematic atmospheres, water circuits, zip lines, 3D movies, artificial pools and ponds all in order to confuse our conscience and remind us how important our senses are. 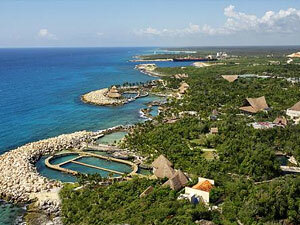 Visit the archaeological zone of Tulum and get to know the new park Xenses on the same day! Travel comfortably from your hotel to the Tulum archaeological site and enjoy a guided tour through its vestiges, the only ones built facing the sea. Afterwards, be ready to awaken your senses at the new park Xenses. This package also includes box lunch onboard the transportation. The minimum age to enjoy 5 years old. Children under 5 years old have free admission. Children 5 - 11 years old get half off the adult ticket price. An official ID must be presented at the Park's ticket booths. Important: Some activities included in this tour are not suitable for people with severe physical or motor handicap, serious heart problems, fear of heights, claustrophobia, persons with recent surgeries, back pain or who weigh more than 300 lbs. Zip-lines have a minimum height requirement of 4.5 ft and a minimum weight requirement of 88 lbs. Some activities are not recommended for pregnant women. Some activities include water areas with a depth between 3.6 and 4.2 ft. It is recommended children under 4.2 ft tall who can not swim be accompanied by their parents at all times.